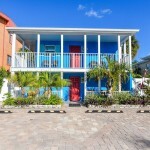 We have four wonderful, affordable vacation units available on Siesta Key. Everything has been recently remodeled. Kitchen is fully equipped with cookware, dishes, coffeemaker, microwave, stove, oven, and refrigerator. Nice screened patio off of the living room with table and chairs. Coin-op washer and dryer available in the laundry area and beach cart, chairs, cooler is in the storage room beside the laundry room. Beautiful, quiet and peaceful home away from home on the south end of Siesta Key beach. Cozy, very clean, and located in a quiet area. Only a short walk to the beautiful sugary sand beaches on Siesta Key. Enjoy the best sunset viewing location on the key and enjoy Siesta Key Village for entertainment and food. It’s the perfect Florida beach vacation destination. We're only a 5 minute walk from Beach access #13 or 0.3 miles, about 2 short blocks before you reach the beautiful sandy beaches of Siesta Key. Close to a grocery store, convenience store, dining, drug store, and anything you might need is only a short distance. Rent kayaks, paddle boards, bikes, scooters just steps away from the condo.